DAMASCUS, Syria -- At least 12 people were killed in a string of bombings inside government territory in Syria, state media reported Monday. 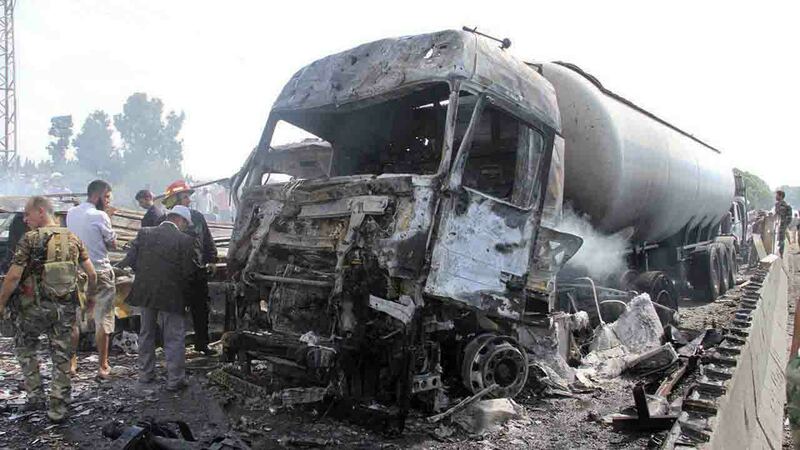 The governor of Homs province said a car bomb struck a military checkpoint in the provincial capital, Homs, killing two soldiers and injuring four others, one critically. The city, Syria's third largest, is largely under government control, with only one neighborhood still under opposition control. Monday's bomb exploded in the government-held Bab Tadmor district, SANA said. An attacker detonated his motorcycle at the Marsho roundabout in the northeastern city of Hasakeh, killing five, SANA said. Government military forces withdrew from the city in August after street battles with the Kurdish autonomous self-defense force for the region, the YPG. The YPG and its political wing, the PYD, inherited control of the city, though the state's police force remained. SANA also reported an explosion in the Sabbourah suburb of the capital, Damascus.